Hello and welcome to 2018! If you’re new around here, I started sharing quarterly updates about my business to give you all a peek at what it’s really like to start a business from the ground up. They say to write blog posts that you like reading and I love reading these types of blog posts. My hope in sharing these with you is to inform you on what it really looks like to intentionally build a business, encourage you when you’re feeling like you can’t go on, and help you realize that this ‘ish is a twisting rollercoaster that is always evolving and changing. If you want a bit more background on my business as a whole, check out my update from last quarter. I wanted to share what Q4 of 2017 looked like for my business as well as a look at what’s coming in 2018 and my word of the year. Hope you enjoy! Uhhh, what? Where did this come from?! This was not on my radar at all to attend, but one Thursday night I got it in my head to look up conferences in my area and lo and behold, FinCon popped up. I had heard of FinCon before but had never considered going because, well, a financial blogger I am not. But on this Thursday night, I was desperate to meet new people in person. I was having somewhat of a breakdown, feeling alone in entrepreneurship and really craving being around other people physically. I’ve talked about the rollercoaster of running your own business, and of course, my husband and friends (both in the flesh and virtual) are amazing, but there’s nothing that beats in-person meetups where you can talk with other people who get it. So when I saw FinCon pop up, and I was vaguely familiar with it, I decided on a whim to attend. I mean, it was happening 10 minutes away from my apartment so I basically had to go, right? Attending this conference changed the trajectory of my business. Bold statement, but it’s true. I had several huge realizations during this conference, but the one that stood out to me most was that for my own personal development and for the betterment of my business, I need to be going to more in-person events. I met a group of girls at the conference that I immediately connected with, I got to meet Pat Flynn who was the person that introduced me to this whole world of online business, I even got a couple of clients out of it (maybe more, a few are in the works)! Overall, my business is all about building relationships with other people and the best way to do that is in person. I have 4 conferences planned for 2018 and I can’t wait to see how else I grow as a person and business owner. Lesson learned: Prioritize in-person meetups, whether it’s ones that are in your own city or traveling to conferences across the country. Speaking of connections…I connected with so many amazing people in Q4. Most were via a video chat or phone call, but several people I got to meet in person! This girl and I were meant to meet. You may remember her from episode 010 of the podcast but that was just the tip of the iceberg. We’re working hard on a fun project these next few weeks that I can’t wait to share more about and we’re even attending the Ignite Your Soul Summit with Amber Lilyestrom in April together so to say we became fast friends is an understatement. Can’t wait to meet her in person!!! Check out Alli’s blog if you want to know what it’s like to be a freelance writer. Nevica and I are in the same circles online and I’m shocked it took us until last quarter to finally chat. Turns out, we’ve had several of the same clients and had no idea! Nevica is one of the kindest people I’ve ever met and boy is she good at her job. I’m hoping I can find an excuse to travel to NYC to meet her. Are there any entrepreneurial conference I should go to in NYC? I’ve followed Jessica for over a year now (can’t remember how I found her blog!) and since we started our businesses around the same time I’ve always loved following along. She’s also a fellow PR gal and I loved getting to talk shop with her. She just celebrated her 2nd anniversary of leaving her corporate job and shared her top 10 popular blog posts. All are must reads! Jaimie and I have been Insta-friends for a while but we exchanged services in Q4 and this girl…LOVE HER. She’s an Instagram strategist and I’ve never really been strategic about Instagram so I knew I needed help. In exchange for her giving me an Instagram strategy (that allows me to actually BE myself), I gave her a 90-minute PR intensive and we both had so many breakthroughs. I love witnessing those “aha” moments with people. It’d be amazing to meet all of my clients one day, but I currently have three overseas. Looks like I need to plan an international trip ! Lucky for me, the FinCon team is actually based here in Dallas and they have a local meetup every quarter. Of course I had to attend after going to the conference! Everyone that’s in the FinCon community is incredible (and so nice), I feel so fortunate to get to hang with these people. I even got to speak with PT, the founder, of FinCon for a bit about PR. Who knows, maybe I’ll get the opportunity to help out even more! I already booked my ticket for this year’s conference :). Lesson learned: Have Skype dates, phone calls, or grab lunch with people you admire. You never know what ideas could pop up out of these conversations. Let’s quickly review my Q4 goals before we get to the good stuff: my word of the year for 2018! Closing out 2017 with a bang with my clients: I feel like I did a great job at this while also being able to take a break for Christmas while we traveled to LA. I have some big projects on the horizon with my clients and I wanted to be prepared for the year ahead. Dream, plan and think about the future of my business: I spent a lot of time dreaming and planning for 2018 and beyond. My PR business has grown in ways I didn’t imagine, so I find myself constantly pivoting and reevaluating where I spend my time. 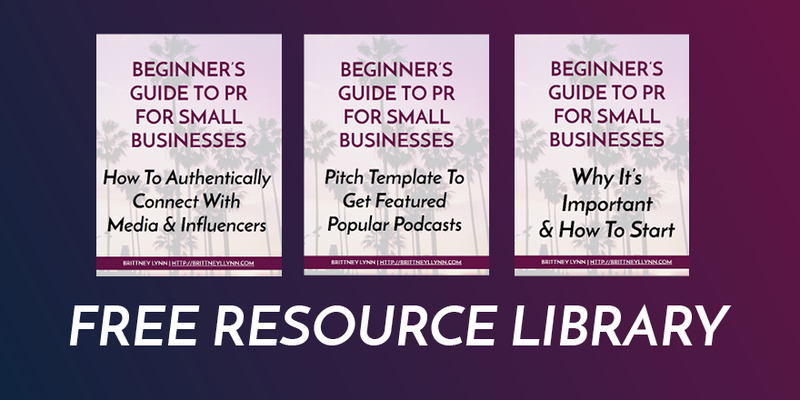 Overall, I’d love to continue to grow my business, not only by bringing on more clients but also increasing my influence to help even more people learn how to use PR for their business. Stay tuned for more lower-priced options such as ebooks, courses, workshops, and more! My word of the year for 2017 was Growth and holy heck did I grow. Whew, I got tired just typing that out! But in all seriousness, 2017 was an incredible year of growth for me, in more ways than I expected. The part I’m most proud of is the mental and emotional growth I’ve done. Going to therapy regularly really helped with this and while it may seem odd that I’m sharing this part of my life with you, it’s not to me. My mind is what runs my business. If I’m not mentally in a good headspace, I can’t be the best business owner I know I can be. Going to therapy and having someone to talk to about my fears, struggles, and stresses extremely helped me. It’s even what I credit for accomplishing all I did this past year. If you aren’t taking care of yourself, who else will? I’ve never been someone who likes the spotlight. I’d much rather be behind the scenes. Which is fine, I’m not ashamed of that in the least. But, I do think much of that has to do with fear of being seen, not necessarily because I do my best by being behind the scenes. I’ve never liked rocking the boat. I prepare myself so I know exactly what to expect in any situation. The thought of offending anyone or even disagreeing with someone gives me a lot of anxiety, so I often say nothing. These things aren’t inherently bad, but there are times that I wish I’d spoken up. I want to be more visible in my own personal life: sharing my thoughts and ideas about topics that may be different from other people, standing up for the people in my life, standing out in my faith and Christianity, etc. I also want to be more visible in my business: going on podcasts, landing more editorial interviews, doing more live videos, etc. Putting myself out there will, of course, help me continue to grow as a person, but it will also help my business. I already had someone message me sharing that they appreciated me sharing press I’ve gotten for myself because it shows that I actually do know what I’m doing for PR. I need to practice what I preach for myself, even though it’s slightly terrifying. I hope you enjoyed my Q4 business update and getting a look at what’s coming up next for my business. I’m excited about the rest of 2018 and would love if you shared your goals for the year too! Leave a comment below so we can cheer each other on.